Symptoms of sprains include pain, swelling, tenderness, bruising and joint stiffness. Symptoms of strains include muscle spasm and weakness, pain in the affected area, swelling, redness and bruising. Immediately following an injury and before being evaluated by a medical doctor, you should initiate the P.R.I.C.E. method of treatment. Rest:Give rest to the affected area as more damage could result from putting pressure on the injury. Ice:Ice should be applied over a towel to the affected area for 15-20 minutes every two to three hours during the day. Never place ice directly over the skin. Compression: Wrapping the knee with an elastic bandage or an elasticated tubular bandage can help to minimize the swelling and support to the injured area. Diagnosis involves a thorough physical examination. Your doctor will inspect the area of injury and joint mobility. X-rays or other tests may be ordered to rule out fractures or other pathology. Your doctor may prescribe nonsteroidal anti-inflammatory drugs to reduce pain and inflammation. Physical therapy may be recommended for severe injuries. Surgery is rarely needed. The hip joint is a ball and socket joint. The "ball" is the head of the femur, or thigh bone, and the "socket" is the cup shaped acetabulum. The joint is surrounded by muscles, ligaments, and tendons that support and hold the bones of the joint in place. Hip dislocation occurs when the head of the femur moves out of the socket. The femoral head can dislocate either backward (posterior dislocation) or forward (anterior dislocation). Acromioclavicular joint (AC joint) dislocation or shoulder separation is one of the most common injuries of the upper arm. It commonly occurs in athletic young patients and results from a fall directly onto the point of the shoulder. It involves separation of the AC joint and injury to the ligaments that support the joint. The AC joint forms where the clavicle (collarbone) meets the shoulder blade (acromion). A mild shoulder separation is said to have occurred when there is AC ligament sprain that does not displace the collarbone. In more serious injury, the AC ligament tears and the coracoclavicular (CC) ligament sprains or tears slightly causing misalignment in the collarbone. In the most severe shoulder separation injury, both the AC and CC ligaments get torn and the AC joint is completely out of its position. Type II occurs within 2.5 cm below the lesser trochanter and, Type III occurs between 2.5 and 5 cm below the lesser trochanter. The Femoral neck is a part of the thigh bone (femur) which connects the head of the femur to the shaft of the femur. An injury or crack caused in the femoral neck due to repetitive force, overuse of the bone or insufficiency in bone development is termed a femoral neck stress fracture. These fractures are usually caused in athletes and gymnasts because of their excessive training and changes in practice surfaces. The most common symptom of a femoral neck fracture is deep thigh or groin pain which increases during your activity, spreads to other parts, and increases during the night or while sitting on the chair with your legs down. Femoral neck stress fracture can be diagnosed with the help of a physical examination and tests such as the fulcrum test or one-legged hop test. Your doctor may also recommend imaging tests such as X-rays and MRI to confirm the diagnosis and find the specific location and cause of the fracture. Femoral neck stress fracture is treated by taking complete rest from your sports activities. Your doctor may also recommend physical therapy to improve your mobilization and stretching abilities. For severe fractures, surgery would be necessary. Runner's knee, also called patellofemoral pain syndrome refers to pain under and around your kneecap. Runner's knee includes a number of medical conditions such as anterior knee pain syndrome, patellofemoral malalignment, and chondromalacia patella that cause pain around the front of the knee. As the name suggests, runner's knee is a common complaint among runners, jumpers, and other athletes such as skiers, cyclists, and soccer players. The most common symptom of runner's knee is a dull aching pain underneath the kneecap while walking up or down stairs, squatting, kneeling down, and sitting with your knees bent for long period of time. The shoulder is made up of the clavicle (collar bone), humerus (upper arm) and scapula (shoulder blade). The shoulder is a ball and socket joint where the ball of the upper arm bone articulates with the socket of the shoulder blade called the glenoid cavity. The shoulder blade is a flat triangular bone present on either side of the upper back. It articulates with the other two bones at the glenohumeral joint and acromioclavicular joint to provide stability and mobility to the arm. Scapula fracture refers to a fracture of the shoulder blade. Scapula fractures can result from severe trauma such as a motor vehicle accident, a fall from a height, contact sports, a fall on an outstretched arm and direct blow on the shoulder during a fight. Scapula fractures are rare but can occur with rib or skull fractures and lung or spinal cord injuries. To diagnose a scapula fracture your doctor reviews your medical history and performs a physical examination. Imaging studies including X-rays and a CT scan may be ordered. Scapular fractures can be treated with nonsurgical or surgical intervention depending upon the type of fracture. Nonsurgical treatment involves immobilizing the shoulder with a sling for 3 to 4 weeks, allowing the bones to heal on their own. Your doctor will prescribe medication to manage your pain. Physical therapy and stretching exercises should be started a week after the injury to reduce stiffness. Scapular fractures that involve displacement at the glenoid articular surface, or fracture of the scapula neck or acromion process may require surgery to repair. 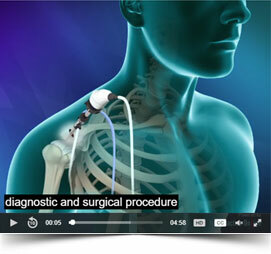 Surgery is performed to align and hold the displaced bones in their proper anatomical position until they heal. This is achieved with the help of screws and plates. The surgery can be performed traditionally by an open method or by a minimally invasive open reduction internal fixation surgery (ORIF). ORIF surgery as compared to open surgery is done by smaller incisions and thus recovery is much faster. Most mid humeral fractures can be successfully treated through conservative treatment without the need for surgery. Your doctor may place the limb in a hanging arm cast or a co-amputation splint for 1-3 weeks followed by a functional brace. Patients will be instructed on range of motion exercises of the fingers, wrist, elbow and shoulder as soon as can be tolerated. The classic symptom of an Achilles tendon rupture is the inability to rise up on your toes. Patients often describe a "popping" or "snapping" sound with severe pain, swelling and stiffness in the ankle region followed by bruising of the area. If the tendon is partially torn and not ruptured, pain and swelling may be mild. The humerus is the upper arm bone. A fracture of the proximal humerus, the region closest to the shoulder joint, can affect your work and activities of daily living. The humerus and scapula articulate or join at the glenohumeral joint. This joint is held together by a group of muscles and tendons called the rotator cuff. Proximal humerus fractures can cause pain and decreased mobility of the arm. The elderly is more prone to proximal humerus fractures from accidents such as falling on an outstretched arm. They may also occur in young people involved in high-energy accidents. Most proximal humerus fractures are not displaced and can be treated by a supportive sling and early rehabilitation. However, if fracture fragments are 5 mm apart or the angle between the fragments is more than 45 degrees, they are considered displaced and will require surgical intervention such as open reduction and internal fixation. Other factors influencing the decision to perform surgery include age of the patient, bone quality, blood supply to the area and ability to tolerate the post-operative rehabilitation. The open reduction and internal fixation surgery involves the reduction of the fracture and securing the correctly aligned bones to allow healing. You are placed in the beach-chair position to allow shoulder movements and imaging from different angles. Sedation or general anesthesia are administered. An incision is made through the anterior and middle heads of the deltoid (shoulder) muscles. The axillary nerve is identified and protected, and the rotator cuff and proximal humerus are exposed. The fracture margins are trimmed and prepared, and the fracture bed is washed. Stay sutures are placed in the tendons of the rotator cuff muscles to gain control of the fracture fragments. Then your surgeon brings the fractured fragments into the correct anatomic alignment by manipulation and pulling on the stay sutures. K-wires are used to temporarily secure the fracture fragments. Once the bones are aligned, strong sutures, screws, or a system of plate and screws are used to hold the bone fragments together. Imaging tests are performed in different angles to verify the correct alignment of the fragments and position of the plate and screws, and to assess range of motion. Following surgery there is a minimum period of immobilization after which rehabilitation should begin. As early as the first post-operative day, you will be made to move your arm as much as you can without too much pain. Physical therapy starts with passive/assisted range of motion exercises. Activities of daily living can slowly be introduced but there must be no lifting or shoulder movements against resistance for at least 6 weeks. Strengthening and stretching should then begin gradually with resistance exercises. It is necessary to monitor progress in movement and strength as persistent weakness may indicate a rotator cuff tear or nerve damage.